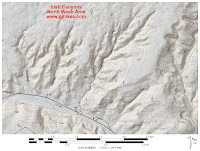 Leprechaun Canyon is part of the Irish Canyons group of canyons in the North Wash area south of Hanksville, Utah. The canyon is very popular with rock climbers that typically drop into one of the upper forks of the canyon. The first mile of the lower part of the canyon is very hikeable and has a nice section of narrows that ends in a slot. This post is for just that portion of the canyon that can be done without any gear or rock climbing skills. To get to the trailhead drive south from Hanksville on UT-95 for 28 miles. There is a turnoff on the east side of the highway across from mile marker 28. The road leads into the mouth of Leprechaun Canyon before coming to an end. There are several primitive campsites near the highway as well as room for a few vehicles to park. An alternative parking and camping area can be found another quarter mile or so further south on UT-95 at the Sandthrax Campsite. 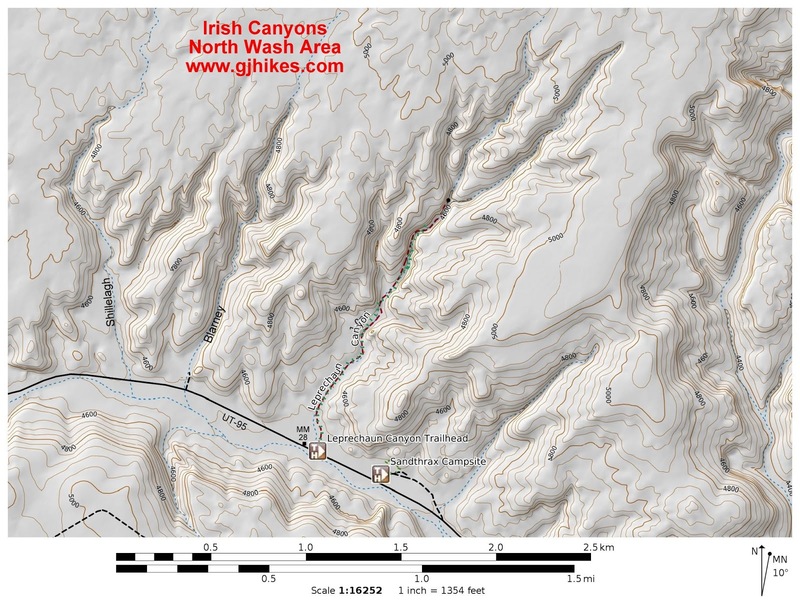 As you head up the canyon you can pick and choose between various social trails and the wash itself. The route is primitive in nature with no signs or markers to go by. A side canyon comes up on the left that we understand can be explored for a short distance before it becomes more difficult. This post sticks to the main channel of the canyon. There are several spots where the thick growth of willows crowds the trail up next to the sides of the wash. The canyon becomes more interesting as the wash comes to a short section of narrows that has a waist high choke stone. It is easy enough to scramble over the stone but shortly after that point the slot gets too narrow to continue and you have to either climb out or back track. Off to the right of the slot is an obvious place where hikers have been scrambling up the slickrock to continue up the canyon. It was too wet and sandy for us to get up the slickrock when we were there so we opted to climb a crack on the other side of the wash. On the trip back we slid down this spot without being able to stop until we landed at the bottom. As soon as you get around the little slot the canyon gets narrower and starts becoming one big slot. After a few more bends it narrows down to a shoulder width passage. It was much too dark in the slot to see anything without using the flash on the camera. After a short distance the slot comes to a dead end where only a climber could continue. Actually, climbers usually drop in from above and work their way down the canyon rather than up it. We hiked Leprechaun Canyon in late October. Weather wise that is a great time to hike it but the sun is low enough in the sky at that time of the year that the canyon doesn't get illuminated enough to get any really nice photos. Being close to a paved highway Leprechaun Canyon is easy to access and only takes a couple of hours to hike. If you would like to see it for yourself then all you have to do is 'Take a hike'.